It is a well known fact that long-distance relationships create many challenges for even those couples who are very intimate. This is because distance removes that day to day physical contact that you have with your partner, which definitely makes an impact on emotions in a relationship. However, don't use long distance as an excuse for a break-up, it is certainly manageable. There are several different ways in which people in long-distance relationships can stay connected in the 21st century. Firstly, take note of the challenges that you both may face during this long-distance between you. This could include a breakdown in emotions and intimacy, jealousy, paranoia or insecurity, one of you withdrawing from the relationship and lack of communication. This is down to the lack of time that you and your partner get to spend together physically. Intimacy builds up by a couple spending a lot of time together, being close, cuddles, kisses etc. This is why distance can be so difficult, because it stops you from being able to have all this often enough to sustain the intimacy. The best way to manage this issue is to use communication as much as you can. For example, skyping everyday at a certain time will give you both something to look forward to, you can see each other and talk to each other almost as if you were in the same room. Another thing is e-mails, phone conversations, texts and making plans to see each other. Jealousy and paranoia can be a huge put off when it comes to relationships, especially long-distance ones. If you make it obvious that you are jealous all the time then your partner will get sick of it and eventually leave. Same applies if you're paranoid that he or she will cheat on you. Not having a strong mutual trust with each other can lead to so many problems. You'll constantly be wondering what each other is doing, who they're talking to etc and this can lead to confrontation and arguments that could cause a break-up. Don't make assumptions about each other. If you're really that worried, then ask them directly, fairly and politely. Don't accuse, don't get angry and don't assume the worst. To make sure that your partner doesn't start assuming the wrong things about what you are doing, it helps if you both have complete transparency within the relationship. This means you should both be open about what you are doing and who you are doing it with, this way there won't be that feeling of keeping secrets or hiding things from each other to make sure no one gets jealous. Even with all these factors taken into consideration, long-distance relationships are still difficult to handle. Everyone copes with missing someone in different ways. Some people wish to constantly be together 24/7, while others are uncertain and doubtful of their future together. These things can lead to withdrawal or dependency on the relationship to keep them happy. These factors can both be very destructive. 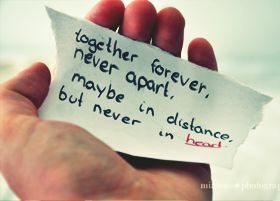 Communication is the most important factor of staying connected in a long-distance relationship. If you do not have this firmly in place, you will not be able to manage your relationship successfully. Talk about your feelings with each other, be honest, go into depth about certain topics and make sure you always have something interesting to say to each other, even if it's a silly story about what you had for breakfast. These small things will bring you closer together, allow you to get to know each other in more detail, and will help you forget about the distance for a little while. It is clear that managing a relationship from a distance is difficult, however, it is not something to give up on, and it is certainly very possible with the right tools and method of communication. So good luck, and may your relationship stay strong.